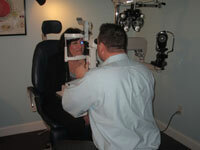 We offer full eye care services to patients of all ages. We also have an extensive selection of designer frames and lens options to choose from. Our designer frames include Gucci, Dolce & Gabbana, Ray-Ban, DKNY, Vogue, and others. We have many Flexible frames for those who are tough on their glasses and TD2 extra-strength scratch coatings for lenses. We also have an extended assortment of extremely light-weight Titanium frames from Seiko, Ray-Ban, and Luxottica, as well as more affordable frame selections from Brooks Brothers, Guess, and Saks. We have an assortment of Kids' Frames by Ray-Ban, Guess, and EasyTwist (practically unbreakable). Contact lens Services include CL Fittings, CL evaluations, and Training for new CL wearers. We carry many brands of contacts to suit your needs. Ask about special rebate options for certain Contact Lens Brands! If you do not see your plan listed, please contact us and we will double-check. New Insurance plans are added all the time.